Once I had decided to hand out the Alfies, as detailed on the previous post, I had to make a lot of other decisions. Again and again, I found myself returning to the original 1953 awards, and the spirit in which they were given. The prestige of the Hugo, the history, the lineage, whatever career-boosting or financial rewards the rocket supposedly carries... there was no way for me to make up for any of that. But I could certainly give some losers an "Attaboy! You did good!" in the spirit of '53. In 1953, there were no losers, just winners. That appealed to me. I wanted these awards to be a celebration, a occasion of happiness. I would award some worthy people, but there would be no shortlist, no campaigning, and therefore no losers. Of course, an "Attaboy!" is nice, but a cool trophy is even nicer. Right away I decided that plaques (boring) and "certificates suitable for framing" would not serve. We needed something much better. Something that could stand next to a Hugo, tall and proud and ready for blast off. In 1953, legend says the Hugos were made from Oldsmobile hood ornaments. But as we now know (see previous post), they were not called the Hugos that year, and were not actually hood ornaments. That would need to wait till 1956. But what the hell, when the legend becomes truth, print the legend. I loved the legend, and I loved the way Alfie Bester talked himself into that first Hugo Losers party, so I decided that my awards would also be made from old 50s hood ornaments. 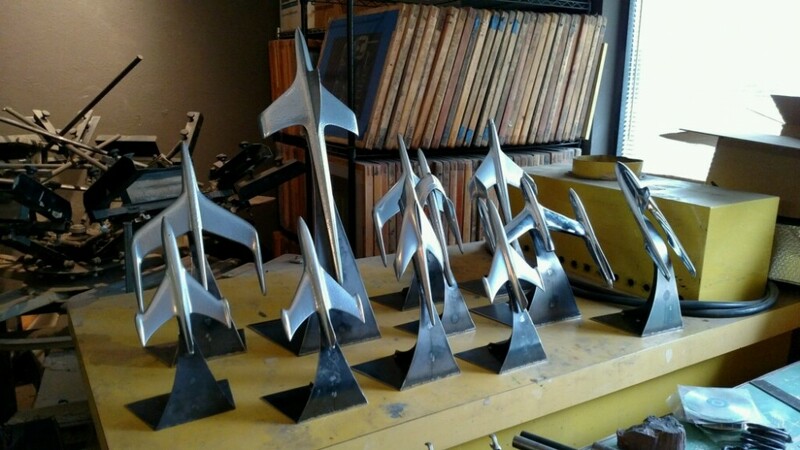 I went up on ebay to look for some, and discovered... gods be good, that really was the "Space Age," half the cars on the road had some sort of rocket or jet on their hoods (to go with those gigantic tailfins). I decided to avoid the 1950 and 1951 Oldsmobile Rocket 88 ornaments on offer (except for one I bought for show 'n tell). The central rocket on those is too close to the Hugo rocket of today, and the Hugo and its iconic design are the trademarked property of the World Science Fiction Convention. I did not want to infringe, nor open myself up to charges that I was handing out 'my own Hugos.' The Alfies needed to look dramatically different... but still cool. Fortunately, even with the Olds taken off the table, I had a wealth of choices. Fords, Chevys, Mercurys, Willys, Lincolns... there were some amazing rocket-shaped thingamabobs out there. Nobody was selling a lot of a dozen identical ones, however, so I realized that the Alfies would have to include a number of different designs. A whole fleet of spaceships, as it were. I set to bidding, and buying. Won some, lost some, dropped out on others when the prices got too high. When they started coming in, I saw right away that some were not as suitable as they'd looked, but others were perfect. None of them were in especially great condition, to be sure. That's why most of them came cheap. Just like that DEMOLISHED MAN rocket from 1953, they were rusted, pitted, corroded by the passage of time. So I turned to Tyler Smith, sculptor and metal-worker par excellence, the guy who made the Beast's head for the Jean Cocteau Cinema and is working on the dragon's head for Dragonstone Studios. Consider him the spiritual heir to the original Hugo-maker, Jack McKnight. Tyler sanded and smoothed the hood ornaments, ground down the rough bits and filled in holes, then had them all powder-coated and rechromed. Then he set to designing bases for them. We rejected the idea of fastening them to wooden backings, like the 1956 Hugo; instead Tyler cut some dramatic metal bases with his trusty plasma-cutter, so the Alfies looked as if they were taking flight. Back in 1953, Jack McKnight worked all through the convention to finish the awards in time for the presentation. Thankfully, Tyler managed to finish the Alfies the day before we were scheduled to take off for Spokane. (Even so, that last week gave me ulcers). In 1953, the concom presumably told McKnight who the winners were going to be, so he could have their names engraved on the bases. We had no such knowledge, so the Alfies had no engraving, no names. We would not find that out who won them until after the Hugo Awards ceremony, when Sasquan released the voting totals. (We do plan to have name plates for the bases engraved now, and will mail them out to the winners). As to who those winners would be... I decided, early on, that I would not attempt to give Alfies out in every category. The Puppies had dominated the ballot as a whole, beyond a doubt, but in most categories there were a couple... or at least one... legitimate nominee. In those races, at least, the voters had a choice. But in five categories no such choice existed: Novella, Short Story, Related Work, Long Form Editor, Short Form Editor. In those categories the only choice was between the Sad Puppies and the Rabids and the Sad/ Rabids. The slates had taken EVERY slot in those races. Unless you were a Puppy, you were not even allowed in the starting gate. Even Secretariat could not hope to win a horserace under those conditions. (I suspected that No Award would win in some of these categories, as I said in my Hugo handicapping. I was shocked that NA won in all five). And it should be stressed: I did not pick the Alfie winners, at least not in these five races. FANDOM picked the winners. The Alfie in each of these races went to the writer or editor who had received the most nominations while not part of any slate. I had no idea who the winners would be until after the Hugo ceremony, when I got my hands on the 'pink sheet' with all of this year's voting details, and was able to check the nomination numbers. My plan had been to reveal the Alfies and announce the winners at the Hugo Losers Party, as a midnight surprise. Turned out to be closer to one, since everything ran late that night. 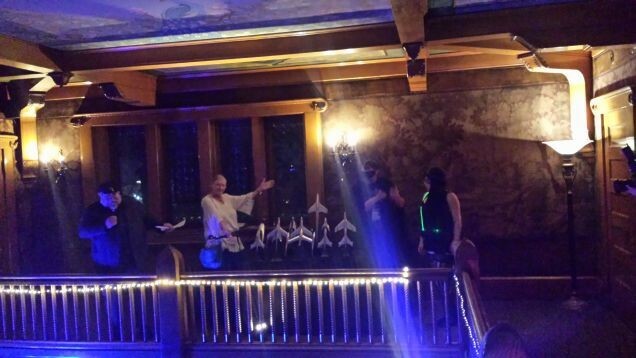 Rather than presenting all the awards myself, I asked a few friends to help me hand them out. Ellen Datlow, Pat Cadigan, David Gerrold, and Robert Silverberg -- stalwart fellows, and Hugo Losers in good standing, all -- came forward to lend a hand. BEST EDITOR, SHORT FORM was the first Alfie handed out. The winner was JOHN JOSEPH ADAMS, who had come in sixth behind the slates with 149 nominations (only 13 behind Vox Day -- if only a few more fans had troubled to nominate, we might not have had No Award winning here). Adams was at the con, but unfortunately not at the party. I had never been able to track him down. BEST EDITOR, LONG FORM was presented by Ellen Datlow, one of our field's leading editors for close on forty years. Ellen has won Hugos and lost more, and probably has more World Fantasy Awards than any other person. Her apartment looks like Easter Island; everywhere you turn, H.P. Lovecraft is staring at you. The winner was LIZ GORINSKY of Tor, with 96 nominations. Liz is a Hugo Loser in good standing, since she has been a finalist several times, but has never won. She's still a Hugo Loser... but now at least she is an Alfie winner, and she was there to accept, which delighted me no end. Next was BEST RELATED WORK. Jo Walton took this one, with 105 nominations, for WHAT MAKES THIS BOOK SO GREAT. Alas, though she was said to be at the con, I never found her, so she was not at the party. (Until I saw the nomination totals, I had been thinking the second volume of William Patterson's Heinlein bio would take this Alfie, but I was completely wrong. And the Walton book is a perfect winner, one that epitomizes the spirit of the original Hugo Awards. It is a big book of Attaboys!, a fond and affectionate look back at the books that made us SF fans). David Gerrold made the presentation. BEST SHORT STORY. "Jackalope Wives" by Ursula Vernon. 76 nominations. Ursula was not at the con, but her friend Mur Lafferty came forward to accept on her behalf. Pat Cadigan made the presentation. Mur spent the rest of the evening having photographs taken of various editors, writers, and fans holding Ursula's Alfie. Hope you don't mind the fingerprints, Ursula. BEST NOVELLA. Robert Silverberg presented the Alfie (a monster, the largest of the hood ornaments I secured, since novella has the biggest stories) to "The Slow Regard of Silent Things," by Patrick Rothfuss, 124 nominations. Patrick was not at Sasquan, so the massive trophy was accepted on his behalf by Scott Lynch. Those were the five Alfies determined by fan vote. I know, of course, that the story with the most nominations does not always win the Hugo in the end, so there is no certainty that John Joseph Adams, Liz Gorinsky, Jo Walton, Ursula Vernon, or Patrick Rothfuss would have won Hugos this year... but we do know, based on the nominations, that they would have been contenders. The slates deprived them of that chance. They may win Hugo Awards in the future, or they may not. This year's rocket is gone forever. But they will always have the Alfie. Attaboy, guys. Attaboy, girls. You did good! But that's not all, folks. Worldcons have the authority to give one special committee award each year, according to the WSFS constitution. I decided I would give some special committee awards as well, in the spirit of those '53 Hugos, where none of the awards were voted on. Not being bound by the WSFS constitution, I could give out four extra awards, not just one. One went to ERIC FLINT. Through these long months of vitriol and mud-slinging, Eric Flint's blog remained an oasis of common sense, facts, and sanity. He kept his calm when everyone else was losing theirs, and he spoke truth, though he had no horse in this race, and no need to speak up at all. I did not always agree with everything he said about Puppygate, mind you, but that's okay. Reasonable men should be able to disagree. His courage and calm words deserved an Alfie... and when next year comes around, I plan to nominate Flint for Best Fan Writer. Two more Alfies went to ANNIE BELLET and MARKO KLOOS. Added to the slates without their knowledge or consent, both of these talented young writers found themselves on this year's Hugo ballot, Bellet for her short story "Goodnight Stars" and Kloos for his novel LINES OF DEPARTURE. It was the first Hugo nomination for both of them, something that every science fiction writer dreams of, a day to be remembered and cherished forever. And yet, when they discovered the nature of the slates and the block-voting that had placed them on the ballot, both Bellet and Kloos withdrew, turning down their nominations. I cannot imagine how difficult and painful a decision that must have been. Bellet's story actually had more nominations than any other short story on the ballot, regardless of slate, which suggests that she might well have been nominated even without the 'help' of the Puppies. And it was Marko Kloos' withdrawal that opened up a space on the ballot for Cixin Liu's THREE-BODY PROBLEM, the eventual winner. They lost their shot at a Hugo (this year, at least -- I think both of them will be back), but their courage and integrity earned them both an Alfie. The last Alfie of the night had... surprise, surprise... nothing to do with the slates, the Sads, the Puppies, or any of that madness. I wanted to give a token of recognition to one of the giants of our field, a Hugo winner, Hugo loser (if you look only at the fiction categories, he has lost more Hugos than anyone, I believe), SFWA Grand Master, former Worldcon Guest of Honor, and Big Heart Award winner... the one and only Silverbob. The coolest Alfie of all (the half-lucite one that lights up) went to ROBERT SILVERBERG, the only man among us to have attended every Hugo Awards ceremony since 1953. There has never been a Hugo given out without Silverberg watching. Just think of that! And that was the night. The party resumed with much hooting and hollering. A few last words. Some people are calling the Alfies an "alternative" award. I prefer to think of them as "supplementary" awards. A way to heal the hurt, spread some joy, reward good work. I wanted them to be a surprise, so I did all I could to keep them secret. Aside from me and my team here in Santa Fe, no one knew about the Alfies ahead of time except the handful of people I asked to help me present them. None of the winners had so much as an inkling. Some of the leading Puppies have oft said that the awards should be about the work. I agree. And looking at the Alfie winners, I could not be more proud of the quality of the work represented. Truly top-flight stuff, and no "boring message fiction" to be found (that was always an empty talking point). Any of them would have done the Hugo proud. So let's have a round of applause for Robert Silverberg, Marko Kloos, Annie Bellet, Eric Flint, Jo Walton, Ursula Vernon, Liz Gorinsky, John Joseph Adams, Patrick Rothfuss. Enjoy your rockets. But remember what Alfie Bester said... they're hood ornaments, and in twenty-three years they may be so pitted and corroded that you'll be welcome at the Losers Party. Congrats to all the Alfie recipients! You're the best-er! That's one hell of a fleet you ended up assembling. And that biggest one? I had one of those for the longest time. I found it somewhere, possibly in a dump. (I used to do some dump scrounging back when I did metal sculpture for a while in school.) I ended up giving it to somebody else who I hope made art with it. That was absolutely the most surreal and awesome night of my life, and I'll remember it forever. Robin and I still haven't stopped talking about it. Thank you again, and it was a pleasure to chat with you over dinner at the 47N shindig. Congrats on handling this with grace under fire, getting the Alphie, and your new book contact. I was fortunate to be there when George & co. handed out the Alfies and the recipients were more than delighted to receive them. I think it was Marko who said the Alfie being given to him by George meant more than winning a Hugo would have. Well done everyone! I have known Annie Bellet since middle school, and it has been lovely to see her journey to a successful author, even with all the drama this year. Thank you. "Truly top-flight stuff, and no "boring message fiction" to be found (that was always an empty talking point)." Exactly what part of 'boring message fiction' is the problem, anyway? Is it just the boring part, or is message fiction wrong by itself? STARSHIP TROOPERS was message fiction for the author's politics, as was (in the other direction) THE FOREVER WAR. Both won Hugos. I don't see anything wrong with that. I loved both those books myself. Such a wonderful thing you did! And bravo for the award to Robert Silverberg; his work has always been magical to me. Congrats to all the Alphie winners. Well deserved. I expect we will see many if not all of the Alphie winners on the Hugo ballots in the future. I've been really impressed with how well Annie Bellet and Marko Kloos have handled the nightmare they found themselves in. Those are great looking awards. You and your team did a great job of keeping this secret which is really hard. Kudos to everyone who helped you put this together. One of the most epic scenes in ADWD occurs in the Great Pit of Daznak, but we never really learn who Daznak was. Was he some ghiscari emperor who ordered to build that pit? I am no one but a fan, and not even enough of one to go to cons or sign up to vote for the Hugos, but: This was an awesome thing to do. Thank you. If you're ever in Grand Rapids or Kalamazoo in Michigan, take a side trip to the Gilmore Car Museum. In addition to all the awesomeness of the cars themselves, one of their outbuildings is devoted to very large collection of hood ornaments, which they call "mascots". Never let success get to your head and never let failure get to your heart. - ? John Joseph Adams and Jo Walton were both at the con, but it's always hard to meet everyone you want to. The Alfies were pretty cool.